Homeopathy, established in the 1800s, is loaded with a wide variety of natural healers. Many have poisonous elements to them, but these pose no risk to humans. After all, only a tiny fraction of the plant is used, and even then it’s decocted. Today let’s take a peek at “Aconite,” which has multiple excellent uses. Deceptively pretty with its violet flowers, the Aconite plant has poisonous roots. In fact, its poisonous powers are legendary: long ago, in the Alps, hunters were said to have rubbed Aconite on their arrows when tracking wolves. 1. Respiratory infections: These include the common cold and croup, most notably. When caused by chills, shock, cold wind. Headache will be present. You may have a bad taste in your mouth. Take at first sign of infection. 2. Cough: A barking cough that is dry and hoarse, and really irritates your throat. Its cause is cold or a dry wind and it is worse at night and in cold air. You can feel the irritation in your air passage. 3. Fever: Aconite is called for if you have had chills, and alternate between feeling hot and feeling cold. Anxiety, fast pulse, bitter taste in mouth, and never-ending thirst may be present. Cheeks may alternate between being pale and being red. You’ll have a tendency to sweat. 4. Ear, eye infections: Inflamed eyes deliver an aching, burning pain. Ear infections are very painful and turn your ears red. You are very sensitive to noise and bright light. Chills and dry, cold weather may have started it all. 5. Sore throat: The pain is burning and stitching and again may have been triggered by chills and cold weather. 6. Shock, anxiety: Emotional shock, severe anxiety, and even fear of death. Panic attacks may set in, with tingling and numbness and dilated pupils. Now for the nitty gritty. Aconite symptoms generally occur suddenly after being in windy and/or cold weather conditions. The face often turns red and any pain involved is sharp. They can also strike after you become fearful, panic-ridden, angry, or highly anxious. You are generally always better in fresh air and you are worse when touched, at night, or in the cold. Anxiety, stress and fear have set in. 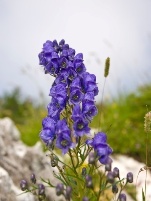 If you think Aconite may be helpful for you, get it from a reliable health store or pharmacy. Do not attempt to make this remedy.